Founded as the home for the Sky Ryders Alumni Scholarship Fund, which will benefit members of the Blue Stars Drum and Bugle Corps. 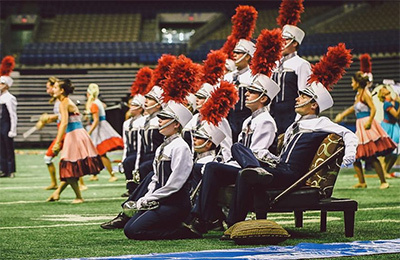 The Blue Stars were selected because their organization and approach to drum corps has very similar qualities to the way the Sky Ryders operated—they highlight and encourage the idea of everyone in the organization as family. Many Sky Ryders alumni have recently adopted the Blue Stars as their current drum corps to donate to, root for, and volunteer with. Although the fund will be to honor the Sky Ryders name and the alumni who marched, taught, and volunteered with the corps, all interested parties are invited to be a part of this project. The scholarship fund will benefit selected members of the Blue Stars to help them with their tour dues. The awarding of funds will be based primarily on financial need, but also will be based on the efforts made by individuals to attempt to raise funds. The Blue Stars will select the individuals to be awarded using these criteria. We awarded scholarships to 8 marching members of the Blue Stars in 2011, 9 in 2012, 13 in 2013, and 12 in 2014. The funds went toward paying their tour fees (which exceed $3,000 these days). The awards were in the range of $250 – $1,500 per recipient. The Blue Stars have a partitioned web page set up to allow donations to be tax deductible, as they have 501(c)3 status. 100% of the donations collected for this scholarship fund will be used as scholarship awards as described on this page. There are no administrative costs whatsoever. The donations are handled through the corps itself, so no third party entity has access to the funds. The donations will be partitioned in a separate fund held by the Blue Stars organization which will be used solely for the intent described on this page. The scholarship recipients are truly appreciative of the help that the Sky Ryders Alumni have provided over the last few years. Take a look at all the touching hand-written letters from the Blue Stars members who have been awarded a scholarship.